In addition to Excel (and the entire MS Office suite), there is an excellent content and document management system also developed by Microsoft that allows for the creation of intranet portals, extranets, websites and collaboration spaces that can be accessed and leveraged by various members of an organization. From the standpoint of the project manager, SharePoint can provide a fantastic mechanism with which to store, disseminate and share information. Which, as everyone is aware, is one of the key aspects of a project manager’s day-to-day duties. SharePoint offers the user the capability of creating a fully functioning website which can then be accessed by anyone (externally or internally depending on security and firewall rules). Additionally, the site administrator can create a singular site that will act as a ‘template’ for additional sites. This allows for more seamless maintenance and updates of any website being hosted by the SharePoint server. From the project manager’s perspective, this allows for an easy way to create and maintain their own particular website without the need to be overly reliant on HTML or website programming. SharePoint has the capabilities of publishing documents and files directly onto the website. Additionally, these files have an inherent versioning capability built into them which will give a running history of who made changes to the file and when that change occurred. This capability is a fantastic resource for the project manager since it provides an easy and fully functional location from which to share documents such as schedules, requirements documents, or any ancillary material the project manager deems would be helpful. The real beauty of the SharePoint feature is that the documents are accessible by anyone in the same way they would be available off of a standard website. There is no need for the users to have to leverage some client to access the documents; a simple browser and internet connection will suffice. Along with numerous widgets and plug-in gizmos that are available to the user when they are creating their initial SharePoint site, there exists a wiki capability. This allows for users to be able to share ideas and comment on various topic threads that may be listed on the site. The wiki also allows for a single access point to view a running history of a particular discussion. This makes things easier from the project manager’s perspective since it avoids having to parse through numerous emails to get a full tally on the discussions that have occurred. The SharePoint site itself, when it is created, can have varying levels of access control instituted against it, depending on the needs of the site administrator. Because users who are accessing the site are generally part of a Windows domain of some sort, there is no need for account creation to be handled. Instead, the administrator of the SharePoint site will likely allow or deny access to individuals as needed. It is generally easier to actually set up specific SharePoint groups, which can be done in the site itself. And once those groups are created, the admin can add and remove individuals to those groups, thereby making parts of the site accessible and restricting others. From the project manager’s perspective, they can create groups for individuals such as general team members, stakeholders, customers, and so forth. Thus, by having groups to leverage, the project administrator can be sure that only certain content is available to certain users. Along with its copious inherent features, SharePoint also has many robust features for the true power user. Additional mechanisms, such as API (Application Programming Interface) access, in the form of web services, is also available. Depending on the skill level of the project manager, some of these access points can be leveraged for other tasks or to assist in automation, as needed. Also, there is an ability to integrate with SQL Reporting Services. Depending on whether or not SQL Server is being used in the organization, the project manager can make reports that are accessible on the SharePoint site that dynamically access data from the requisite server as needed. This makes for an excellent front end interface for reporting needs that will always be populated with the latest data, due to its dynamic nature. 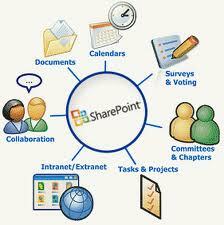 All in all, SharePoint is an excellent utility to leverage for content management within an organization. While there are other solutions available, SharePoint has many specific features that make it stand slightly ahead of the competition. And its general ease of use and shallow learning curve make SharePoint and excellent choice for the project manager looking to utilize its inherent capabilities. For any of us that have spent time within the corporate world, we are all cognizant of organizational changes, realignments, business unit restructurings, and so forth. They are a fact of life for any company. The period and frequency of changes can vary from organization to organization. Some companies can keep a particular organizational structure in place for years, while others feel the need to revamp their particular structure every six months. Whatever the case, changes are a fact of life and must be dealt with, especially from the project manager’s perspective. So what are some key concepts that a project manager should be cognizant of in order to be able to handle these changes? When changes do occur, they generally don’t just materialize from thin air. Usually, a lot of thought goes into any organizational structure realignment within a company. As such, before any change will occur, there will likely be some key contacts that might be able to give you a little insight into the planned changes. A little sleuthing will be helpful in determining what changes might directly impact your area. Note that rumors may actually deviate from the end result, so it is important to be mindful of the fact that until the change is finalized, don’t make radical changes to your project’s implementation. Jumping the gun may result in wasted time and effort in tackling perceived changes that never manifested themselves. 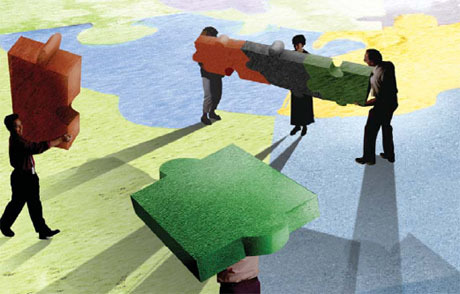 An organizational change will likely result in a shifting of certain key personal, including some of your stakeholders. So the project manager must be mindful of where his/her stakeholders eventually end up and if they are still playing a role in the current project. Additionally, new stakeholders may emerge from the newly created structure and it is important to reach out to them so they are brought up to speed on your efforts. There is no guarantee that the resources you currently have allocated to your project will still be available post a large-scale reorganization. So it is important to keep tabs on how any shifts in personal affect your project. The net number of resources may be the same, but you may be contending with new resources replacing existing ones that are being reassigned elsewhere. This will obviously necessitate a need to bring the new resources up to speed in the most efficient and expedient manner possible so as to reduce any delays to your project. In many cases, the natural catalyst for any organizational change within a company is a desire to realign against industry megatrends. Social networking, Web 2.0, Cloud Computing, et cetera. A company’s future survival depends on its ability to accurately assess industry trends and align their business accordingly. With that being said, the project manager must also be cognizant of company strategy changes and shifts as it pertains to their projects. It is possible that a particular project may benefit from a re-evaluation of its core implementation to have it better align with the corporate strategy. That will also increase the likelihood of continued funding and support for the project as well as ensuring that the end deliverable is better aligned with consumer wants and needs.